Situated at Yuanlin Road and close by the Humble Administrator's Garden, the Lion Grove is a classical garden built by the Buddhist monk Tian Ru in 1342, or the second year of the Zhizheng Reign of the Yuan Dynasty. In its early days it was a temple garden. The garden, rectangular in shape, occupies an area of about 16 mu and also includes a prayer hall and dwellings. The entire garden is laid out according to a compact design, with artificial mountains piled up in the southeast and a water surface the northwest. The Lion Grove is famed for its rocks, assembled in a most fascinating manner. For this it is known as a "kingdom of artificial mountains". Most of the rocks that are scattered in the garden look like lions. Hence the name, Lion Grove. 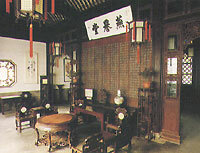 Emperor Qianlong of the Qing Dynasty visited the place on six occasions; he was so fond of it that he had replicas built in Beijing's Yuanmingyuan Garden and Chengde's Mountain Summer Resort.